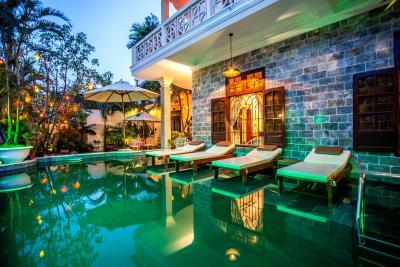 Lock in a great price for Ngan Phu Villa – rated 9.3 by recent guests! The room and bathroom were great. The staff was very kind. The location is near of the center of the city in a silent place. The staff was incredible! They brought me out an orange juice when I arrived to welcome me, and they let you use their bikes for free. The pool was nice, and the room was quiet. The bed was comfortable. Extremely nice and helpful staff. 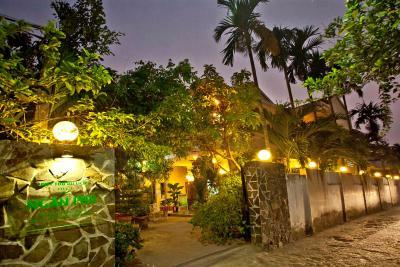 Nice and spacious rooms, terrace and very pleasant surrounding. Excellent breakfast. We loved noodles, coffee and mango shakes! Just awesome. Room, staff, owners, location. Nice breakfast. We felt very taken care of. We arrived a bit late on New Years Eve. They had made dinner for all the guests. They invited us to have dinner with them at the family table. What an honor and the food was superb! Really nice and professional staff, helped us with everything we asked for. We stayed there for 4 nights, enjoyed our stay very much! We did a great cooking class they recomended on, enjoyed the complementary bicycle, and the good and varied breakfasts. Highly recomended! Lovely little spot about a 20 minute walk from the old town. Free bike rental is available, but we found it wasn’t a bad walk. It was nice to be able to come back to the pool in the afternoon after a day of wandering around in the heat. The lady who works at the front desk was very friendly and helpful. She gave us a free smoothie when we checked in that was really tasty. The free cookies they leave in your room are also a nice touch! The included breakfast was also good. Awesome location away from hustle but still near, rent the free bikes and meander around. 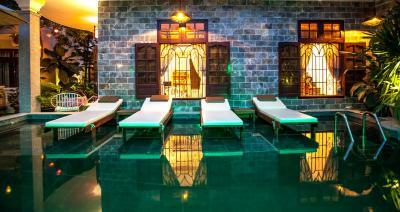 Lovely quiet garden courtyard setting with bonus of a pool to cool down after a hot day. Staff were always helpful and friendly and spoke good English, always checking if we were ok but in no way obtrusive. Rooms were always beautifully clean, fresh towels every day and biscuits! Bed was huge and air con worked brilliantly. Couldn’t recommend highly enough, especially for couples. 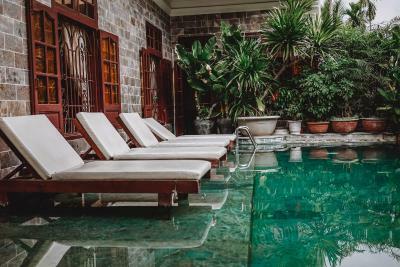 Beautiful little gem of a hotel and amazing value. The room was immaculate and the bed so comfy. 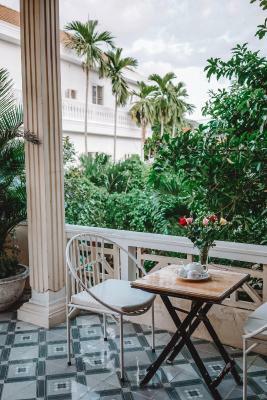 The garden was a beautiful place to eat (breakfast is delicious and varied) and je pool was one of the cutest I’ve ever seen - we loved it. The staff were very helpful and sorted onward travel. It’s perfectly located for the beach and the town (10-15 min cycle either way) and with the bikes it’s so easy to get around. Highly recommend ! 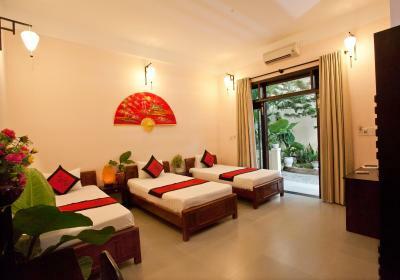 Offering free rental of bicycles, Ngan Phu Homestay provides free Wi-Fi access in the guestrooms. 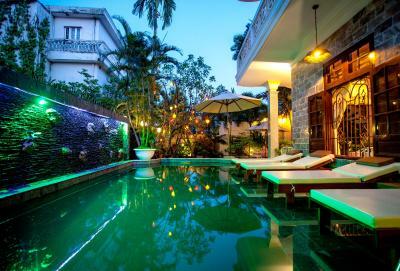 It is just a 5-minute bicycle ride from Hoi An Ancient Town, a UNESCO World Heritage Site. 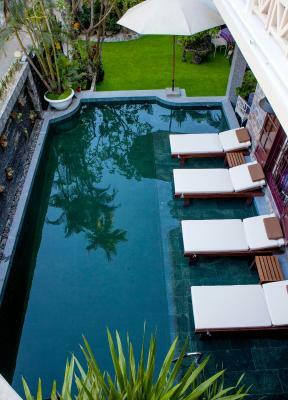 The property is a 10-minute bicycle ride to Cua Dai beach and a 30-minute bicycle ride to the nearest vegetable farm. 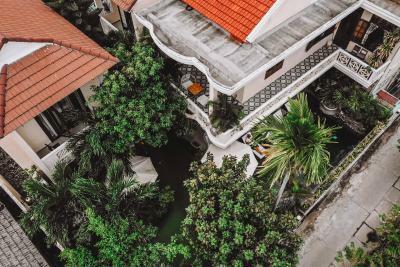 Da Nang International Airport is a 40-minute drive away. 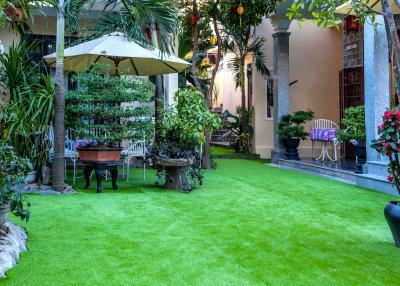 Offering garden views, rooms feature a flat-screen TV with cable channels, a wardrobe and an private bathroom with shower facilities, toiletries and a hairdryer. Luggage storage facility is available, while airport shuttle service can be arranged at a surcharge. The in-house restaurant serves breakfast, lunch and dinner upon request. 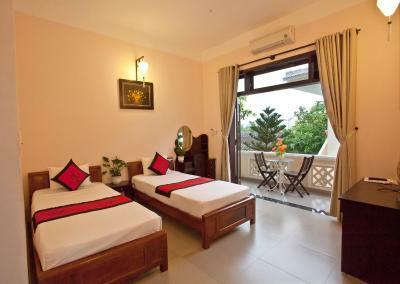 When would you like to stay at Ngan Phu Villa? 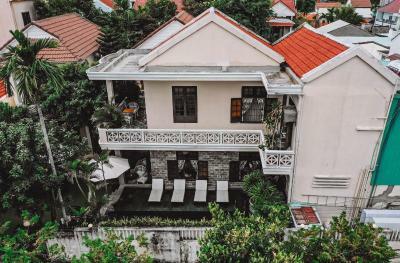 Offering city and garden views, rooms feature a flat-screen TV with cable channels, a wardrobe and an private bathroom with shower facilities, toiletries and a hairdryer. 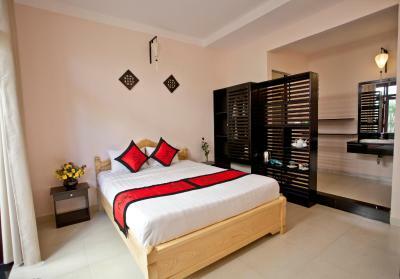 This single room has a seating area, air conditioning and tile/marble floor. 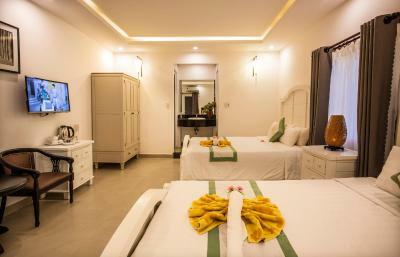 This twin room has a seating area, air conditioning and flat-screen TV. This single room features a tile/marble floor, air conditioning and seating area. 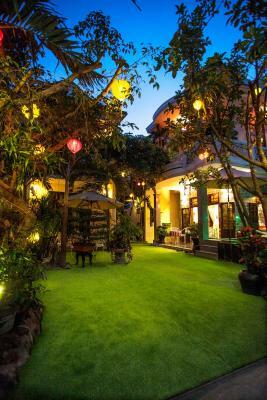 House Rules Ngan Phu Villa takes special requests – add in the next step! One child under 6 years is charged VND 116629.05 per night when using existing beds. Ngan Phu Villa accepts these cards and reserves the right to temporarily hold an amount prior to arrival. Bicycles are subject to availability. 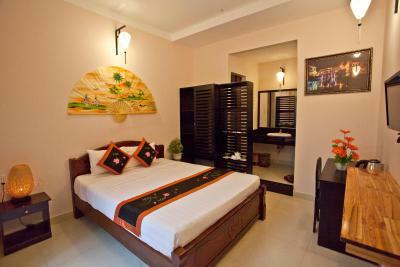 Please inform Ngan Phu Villa of your expected arrival time in advance. You can use the Special Requests box when booking, or contact the property directly using the contact details in your confirmation. Friendly helpful staff. 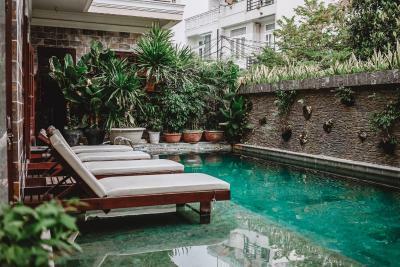 Good pool, good breakfast and comfortable room. The price was fair. 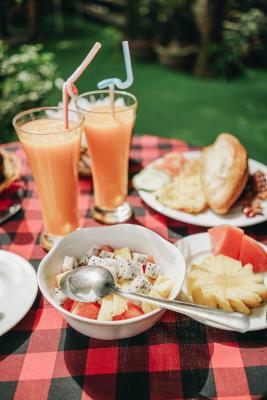 Delicious breakfast (you can choose an option from a breakfast menu + coffee/tea + juice + fresh fruit), nice little pool, you can use their bikes for free, nice spacious rooms with comfy beds, very friendly and helpful staff. The staff is extremely nice and helpful. 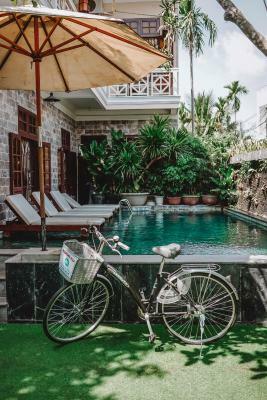 The location is a bit further away from the center but is quiet and the hotel has really good bikes to rent for free so don´t get discouraged by the distance. Th breakfast is also very good. My room didn't have a window, which I didn't like. It was so dark and sad. I think most of the rooms have a window, I think I just was the unlucky one, so I would put that in as a request if that is something that would bother you. Staff was so nice and the breakfast was fantastic!! Staff very kind and helpful. Will stay there again! Lovely hosts. We enjoyed everything. It is close to the center, silence, free bikes, pick up from the airport for a very good price, very good breakfast. Great property with great hosts. loved the warmth with which we were received. we had a triple sharing room, which was very spacious. Good breakfast and they could help ordering food in case you wanted to eat in. free cycles and scooters at nominal cost were available to help one move around town. The staff was helpful in providing tips for sightseeing and whatever other help we needed. Extremely friendly staff. Always went an extra mile to help. The atmosphere was like a home away from home. Nice large rooms. Spotlessly clean. Amazing value and Highly recommended. Everything was fine. The location is a bit outside of the old quarter but close enough to walk. We stayed in the family room on the ground floor. A nice big room with high ceilings.